Each November we have the opportunity to recognize a Kansas foster family for their hard work and dedication at the Kansas Governor’s Conference for the Prevention of Child Abuse and Neglect. “We all know that becoming a foster parent means you commit your heart to children that may have a fleeting presence. We have all heard people say that they couldn’t foster because they couldn’t let a child go. Obviously, we then get the opportunity to share that is exactly the type of foster parents we are looking for – parents that are willing to commit their heart to children that may be broken and not know how to accept the love and stability that is being offered. Being a foster parent means being able to invest in children, to love them, and to let them go. Perhaps one of the most difficult jobs of a foster parent is to commit whole heartedly to supporting case plans focused on reintegration efforts. It takes extra time, extra support of not only the children in your home, but to their biological family. 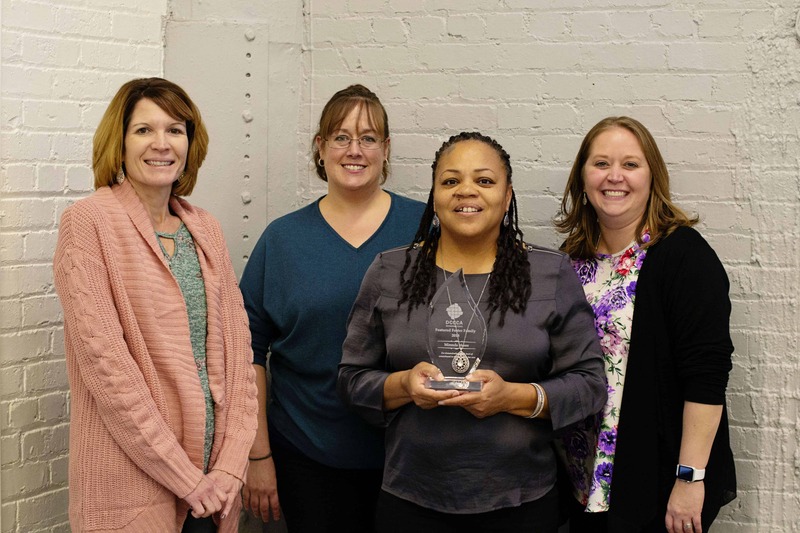 To find an individual whose main focus is supporting families with reintegration plans is a treasure, and that is what we have in Ronda Moore. Ronda began fostering a couple of years ago because of her deep desire to provide children with a stable and nurturing home. She has two biological children and is very active in her church and her community. Ronda believes in keeping children engaged in family centered activities, providing them with new experiences that broaden their horizons. In her fostering experience Ronda focuses on providing respite and emergency care in addition to long term placements. She has dedicated herself to supporting families who have a reintegration plan and to older children who are preparing for independent living. With a focus on making sure every child’s needs are met, Ronda works with therapists, case managers, doctors, and biological families to provide the support and care the children in her home need. She goes above and beyond to make sure that each child knows that they have someone on their team that is fully committed. For these, and so many more reasons, we have chosen Ronda Moore as our Featured Foster Family for 2018.” ~Jeanette Owens, DCCCA Director of Children and Family Services, in her speech at the Governor’s Conference. Thank you, Ronda. You are so very appreciated.